Last year I wrote a post in which I commented on the popularity of an individual’s slides and speculated on ways in which the 12,000+ views (now 24,400 views!) on Slideshare for Steve Wheeler’s talk on Web 3.0 The way Forward could be related to impact and value. In this post I will discuss the implications of usage statistics for a event’s use of Slideshare over a period of four years. UKOLN’s annual IWMW (Institutional Web Management Workshop) series has made use of Slideshare for hosting slides since 2006 (note that since Slideshare was launched in October 2006 this means that we uploaded the slides for IWMW 2006 after the event was held). The slideshows for each year are available in the following Slideshow event groups: IWMW-2006, IWMW-2007, IWMW2008, IWMW2009 and IWMW2010 (note we changed the naming convention in 2008 once Twitter started to gain in popularity). 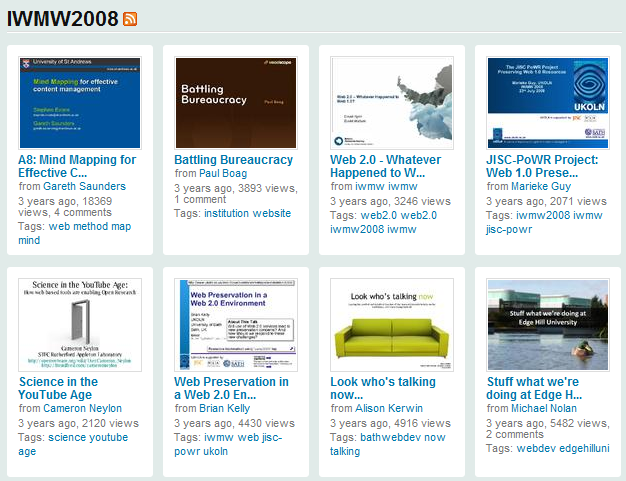 Also note that since not all of the slideshows have been added to the event groups the analysis also made use of the Slideshare tags: IWMW2006, IWMW2007, IWMW2008, IWMW2009 and IWMW10. The numbers of views for each slide are available on Slideshare. A Google Spreadsheet has been created which summarises the figures. The overall totals are given below. Year Nos. of views Total nos. 2006 48,360 11 11 0 Slides added retrospectively. 2007 44,495 7 5 2 Slides from 2 w/shop sessions included. 2008 94,629 17 8 9 W/shop facilitators encouraged to use Slideshare. These figures help to identify changing patterns of usage which I was not previously aware of. It would appear that when Slideshare was first launch we uploaded the slides for the plenary talks (which we had available on the UKOLN Web site). The following year we continued to make the slides available on Slideshare, although I don’t know if this was done in advance or not. In addition we subsequently noticed that two facilitators of parallel sessions (Phil Wilson, University of Bath and Adrian Stevenson, at the time at the University of Manchester) has uploaded their slides (on University 2.0 and Knowing Me Knowing YouTube) with the event hashtag. Since we were aware that participants at the event where interested in seeing the slides from parallel sessions they were not able to attend in 2008 we encouraged workshop facilitators to make there slides available using the event hashtag. It was possibly around this time that Slideshare ‘groups’ and ‘events’ became available and so we tried to ensure that such slides were also aggregated in this way. The IWMW 2006 event also marked the first ‘amplified’ IWMW event with a WiFi network available for participants. In addition there was also a limited amount of video streaming at the event (using Access Grid technologies). Since IWMW 2007 we have, I think, live-streamed all of the plenary talks and encouraged the remote audience to participate in discussions. In order to make it easy for the remote audience to view the speakers’ slides we have sought to make slides available using Slideshare when the talk is being given. The initial use case, therefore, was primarily for the live remote audience, which peaked at about 170 viewers for Ewan McIntosh’s talk at IWMW 2008 – any additional views may be considered an unexpected bonus. In this case, since there have been 26,021 views to date, we might regard this as a significant bonus. However this would be misleading since the Slideshare is actually a Slidecast containing an audiostream which had been created for another version of this talk. Seeing the data on the numbers of views of the various slideshows over the years made me wonder which were the most popular slides and if there were any identifiable patterns for these popular slides. The table below lists the most popular slides for the plenary sessions and the parallel sessions. With the exception of 2006 the most popular slides have been presented by people outside the higher education sector, although Ewan McIntosh of his presentation at the time worked for LTScotland, a public sector educational body. Does this suggest that speakers form outside the HE sector are better speakers, provide better slide shows or perhaps have more effective online professional networks – in the case of Ewan McIntosh in particular he attracted a large live audience for the live video stream of his talk and with 9,691 Twitter followers currently would be well positioned to make his professional community aware of this resource (incidentally Jeff Barr also has an extensive Twitter network with 8,333 followers). The workshop facilitators and barcamp presenters with the largest numbers of views of their slides are, however, from the HE sector. It was interesting to observe that these popular slides seem to have an personalised design, such as the slides used by Adrian Stevenson in his Knowing Me, Knowing YouTube presentation. Might this suggest that a corporate design for slides is off-putting to potential viewers? After all whilst participants at the live presentation have no freedom of choice, those who chose to view slides on Slideshare may be more like to access attractive-looking slides. Alternatively perhaps those who are prepared to challenge organisational branding guidelines may be more likely to have interesting ideas to present? Back in 2009 in a post on The Slideshare Lessons Martin Weller reflected on how over a period of three years through his use of Slideshare he had migrated from use of the OU corporate identity to a personalised style of presentation. It was also order medications interesting to note that all of the popular slides have been embedded in other Web pages, blogs, etc. For me this is an important part of the social sharing provided by Slideshare – it allows the content to be easily reused and discussed elsewhere. Martin Weller made this point in his post on The Slideshare Lessons when he said: “by sharing good Slideshare presentations you are sharing ideas, and people will react to these. It can be in the form of comments on your blog post which features the presentation, on the Slideshare site itself, or through other social media such as twitter“. Why, I wonder, are people still hosting their slides in the silo of an institutional Web site when the slides can easily be made available as a social object? The post has explored some of the implications associated with views of slides hosted in Slideshare. Although the statistics provided in the free version of Slideshare do not provide trend analyses (for richer statistics a Pro account is needed which costs from $19/month) I think we can assume that significant numbers of views take place after the event and such usage patterns can be decoupled from use by a remote audience viewing the slides whilst watching a live video stream of the talks (and, in any case there is no video stream for the parallel workshop sessions). The slides may be being viewed by attendees at the workshop who wish to review the information at their own pace after having watch ed the live talk. In addition as discussed in a post on “I want to attend all the parallel sessions” participants often wish they could find out more about the parallel sessions which they were not able to attend. We are now seeing more of these materials being made available by the facilitators of these workshop sessions. Since we now have evidence that such resources are being used we will make greater effort to encourage people to share their slides using the event hashtag and group for this year’s event. But in addition to the 170-200 people who have attended the event in recent years it is likely that the slides will have been viewed by those who did not attend the event. Use of Slideshare provides a means of sharing the ideas discussed at the event more widely as well as raising the profile of the speakers. In addition this may also help to raise the visibility of the event itself. The popularity of the slides also seems to challenge the criticisms of PowerPoint as a flawed tool for supporting learning. If this is really the case, then why are so many people choosing to view such slides? The popularity of the slides used at IWMW events may provide an indication of the value of the event itself for providing a forum for sharing of ideas. We will be looking to build on this by encouraging speakers and facilitators to make their slides available and also to suggest that they may wish to share access to these resources within their own professional networks. The popularity of Ewan McIntosh’s screencast of his talk (which contains an embedded audio) suggests that providing synchronised audio with the slides could provide an even richer resources for use by others (and since my most popular slideshow, which has been seen on 19,501 occasions, is also one of my few screencasts I think this is the case). It would therefore appear desirable to capture the audio for talks – although, even if this provides value to others, it may be questionable as to whether the effort required to synchronise the audio with the slides can be justified. It would be useful to make comparisons with other IT-focussed events which have also made use of Slideshare over a number of years. I know that the Eduserv Symposium have also used Slideshare event groups for their annual event which are labelled esym09, esym10 and esym11. These symposia last for a day, unlike the IWMW events which have taken place over three days. But although the numbers of slideshows will be less it would be interesting to see if the number of downloads shows a similar pattern. It would also be interesting to make comparisons with similar events which have chosen not to make use of Slideshare, and perhaps provide access to PDF copies of slides on the event Web site. In light of the failure for such resources to be embedded elsewhere and the lack of a easily obtainable evidence of their reuse, can a decision not to make use of a social sharing resources for slides still be justified? The statistics presented in this post may, however, be open to questioning. Did users really view all of the slides of did they just look at one or two? And if a slideshow is embedded in a blog will reading the blog without viewing the slides be treated as a view on Slideshare? It may be useful to investigate the statistics provided on the SlideShare PRO acount. i) Are people more likely to share stuff through something like Slideshare? ii) Is the basic unit of sharing (the presentation) at Slideshare, something people understand more than courses and units at OER sites? iii) Is the comparison fair? Can we consider Slideshare an OER repository of sorts? iv) Are commercial operations just better at this than educational ones? v) Are people ‘learning’ from Slideshare? If so, how does it compare with learning from OERs? I think it is clear that people are willing to share resources on Slideshare and people are also viewing the resources in significant numbers. For me the evidence I have gathered has confirmed my suspicion that Slideshare is established as part of the infrastructure for many events organised with in the HE sector and that its use provides value to the sector. Can we afford not to use it?